In Funeral Parade of Roses1, Toshio Matsumoto, in his conflating of the politics of the individual identity with the politics of institutionalised structures such as governments, challenges the idea that the two are disparate elements incompatible with each other. In the tragedy of Eddie, Matsumoto proposes an almost apocalyptic, nihilistic look of the world, revealing the individual’s tragedy at being, inevitably, caught up within structures of his creation whether they are of a personal or political nature. However, Matsumoto accomplishes this beyond the diegetic level of the fictive plot to the level of the spectator’s experience of a film with the use of transgressive2 filmic techniques that break free from formalist film making. Thus, he transforms the relationship between spectator and film in which, typically, the viewer identifies with the central subject, but does not transform this investment of emotive energy into action3 in his own experiential reality 4. 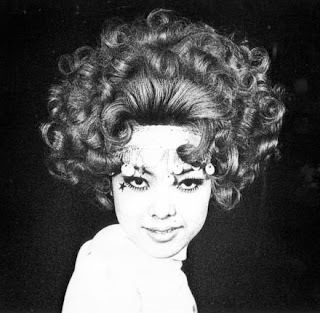 This essay will focus on the cinematographic level on which Funeral Parade of Roses accomplishes this flouting of conventional norms through the distortion of the spectator’s experience. By the complicating of the viewer’s identification with the subject through the distortion of continuity and the blurring of reality and fiction, Matsumoto disrupts the viewer’s expectations of the organic unity of the filmic narrative, challenging the viewer with a form of film viewing in which the viewer is an active subject having to participate and interact with the filmic material beyond the emotive level. The viewer is forced to, having exited the encapsulated bubble of the cinematic theatre, question all forms of illusion, whether they are on the ideology of the self, institutionalised politics or in the politics of cinema implicit in the cinematic apparatus and the process of filmmaking. 2 I am using the term ‘transgressive’ to refer to all forms of action which break away from established norms. 3 ‘Action’, here, can refer to the personal, psychological transformative action, and is not exclusive to the political activism of oppositional politics. 4 I use the term ‘experiential reality’ to refer to all forms of experience taking place in the real, immediate world. In other words, I am referring to the realm of experience outside the doors of the projection theatre. in creating continuity, ensuring the viewer is able to follow the actions, motions and drama of the protagonist. Thus, it is vital for the process of identification and the production of sympathy. As Lyotard states, “all movement which would escape identification, recognition, and the mnemic fixation” (Lyotard 355)5 are erased in favour of the director’s vision. Likewise, in the inscription of movement present in cinematography, the director inevitably sacrifices diversity for unity by removing unsatisfactory shots that do not correspond to the reality the film attempts to project. This includes overexposed shots, or shots with too much glare. Unrelated footage that does not contribute to the continuity of the filmic narrative has, likewise, to be cut. The process of the cinematography is itself an exercise in selective elimination involving the inevitable sacrifice of the complexity of reality for the formation of filmic reality. Thus, “the only genuine movement with which the cinema is written is that of value [emphasis added]” (Lyotard 350); that is, movements only have value in relation to other objects in the movie. Moreover, the physical act of directing puts the director in a position of absolute control wherein he is ‘god’ of the universe of his creation. Through the dictating and ordering of actions in the filmmaking process, the director suppresses the individuality of his actors, the film crew and, in some instances, the human complexity of the characters in order to make a film. Directing, hence, involves a domineering structure of totalising control in which issues of power play a central role. 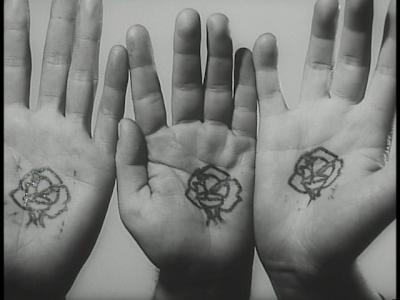 In Funeral Parade of Roses, Matsumoto subverts this system of totalising control by the revealing of the directing process. In reminding the viewer that film is a product of an individual’s subjective reality- in other words, a creation-, the viewer is forced to re-orientate his relationship to the film. The focus, thus, shifts from the narrative imminent to the film itself as an entity in connection to other physical realities. In a particular long shot towards the middle of the film, the director is shown hovering over an Eddie who is putting on his clothes having just finished shooting a love scene with his co-actor for the movie he is acting in. The director calls out ‘cut!’; his shout pierces the previous carnival-esque music that played in the close-up sequence of the love scene, pulling the viewer away from the intimacy of the previous shot into a more distanced panorama. The director proceeds to dictate the next stage in the directing process in which an interview sequence will be filmed. The focus of the shot, here, is on the overexposed bed in which Eddie is putting on his clothes. The director is central to the shot, and the cameras, lighting equipment and crew are situated about him; prominent, too, is a lamp which shines directly upon his darkly-clad figure. In this shot, the viewer’s attention is drawn directly from the central protagonist of the story- Eddie- to the director, who is shown surrounded by the filmic reality he is creating. In this instance, an amount of unease is created in the viewer as the film narrative is physically put in the background, and the director and his crew put into the foreground. In the centrality of the director’s position, the viewer is reminded that the director is like a God-like figure in his ability to create and dictate an encompassing world, and in turn, that the process of film watching involves the active believing and engaging in this projected, subjective reality. The lamp situated above the director’s head, in resembling a sun, draws an allusion to the centrality of the director in his world in a geocentric system wherein planetary bodies- the film audience, in this case- revolve around the director’s will. The distancing of the actors and the re-emergence of the ‘invisible’ process of filmmaking (the ‘backstage’ where the ‘strings are pulled’), in this case, disrupts the viewer’s idea of the integrity of all creation. The film world is shown as being the creation of a single human being according to values that he accords, and the viewer is forced to re-orientate himself in situation with the diegesis in light of this revelation. Thus, in the focussing on the director as central subject, the viewer is shown that the process of film making is innately political, involving a ‘director’ in the act of ‘directing’ the actions of others. In other words, it is an inherently political process involving plays of power and control. As the actors and crew are expected to follow certain protocols of behavior for the production of the film, the audience, too, is expected to identify with the subject matter in accordance to the director’s will. In being alerted to the system that envelops the directing process, the viewer is shown the inextricability of cinema and politics. Just as the citizen’s individuality, thus, is sacrificed for the perpetuation of society’s economic forces in the capitalist system, so film- through the totalitarian process of directing- sacrifices the diverse personalities of its actors for the creation of a filmic reality. The insertion of shots in which the director re-emerges with the cinematic apparatus, thus, threatens the integrity of creation and the notion that film is an objective reality free from systems of totalising control, forcing the watcher to rethink his relational position to the filmic matter and all systems of invisible policing that may lay hidden in his experiential reality. The projection screen and projector, likewise, are imbued with systems of value encoded by the director’s vision. It creates temporality through the flashing of a series of still images into a geometrical curve of movement by which continuity and consequently, “meaning and consciousness” (Baudry 291) arises. The creating of the filmic ‘consciousness’ is vital in the creation of a passage of time in which the narrative can play out. However, the projection process hides the invisible ‘unconsciousness’ of the film strip6. Like the disparate, seemingly senseless images in dreams, it is made out of discrete units of static images with minute differences. It is through this ‘slicing’ of moments in time in the sacrifice of these minute differences (which were in turn carefully chosen by the director to conform to an overarching narrative) that static images are given meaning and are able to rise to the conscious ‘daylight’ realm of the cinema to create continuity and meaning, allowing for potentials of identification with a homogenous subject embedded in a narrative. In Funeral Parade of Roses, the viewer’s relationship to the subject is complicated by the sudden, inexplicable emergence of the filmic strip from the ‘unconscious’ realm behind the projection screen. Inevitably, he is drawn from the congruity of the narrative into discontinuity, and a shift in identification, likewise, takes place. In a particular shot towards the end of the narrative, the viewer’s point of view is shifted from a close-up of Eddie’s bloodied face facing the mirror to that of the filmic strip containing a series of images that make up the shot. Prior to this shot, the oedipal tragedy had reached its climatic moment, as Eddie confronts his own image in the mirror and, unable to handle his revealed self in the light of his crime, pierces his eyes. The shot is a close-up shot of Eddie’s face in the mirror. 6 I borrow Baudry’s metaphor, in which he likens the film strip to the unconsciousness of the film. Like Eddie, the viewer is put in Eddie’s position facing the mirror which shines disturbingly with a prophetic light. Thus, a confusion of identity occurs in which the viewer, enveloped in the tragedy of Eddie’s fate, forgets his own reality. The shot, thus, creates sympathy in which the viewer, seeing the graphic image of Eddie’s pierced eyes in the light of the mirror, feels a sense of horror, pathos and repulsion. On a diegetic level, Eddie’s act of piercing one’s eyes can, here, be interpreted as a desire to ‘pierce’ the mask of the persona in a final effort to assert control. Eddie realises that he is ultimately subject to the inevitability of Fate- the principle that orders the world- and in a final act to assert some form of personal control against all systems of oppression, pierces his eyes. The viewer, typically, has reached a point in the narrative in which- in the process of sympathy- he feels the force of Fate delivered to Eddie as though a blow to himself. However, this forcefulness of emotion does not go beyond the fictionality of the plot and relies on the viewer’s ability to believe that film is essentially fiction. However, by pulling the viewer away from the encompassing plot to the micro-level of the filmic strip, the director complicates the spectator’s relationship to the protagonist and his tragedy by drawing him to the filmic apparatus itself and film’s status as fiction reliant on the viewer to invest belief in its manufactured reality. A fracturing of sympathy occurs between subject and viewer, thus, as the focus is turned from the film’s presentation of reality to the individual’s personal reality. The differentiation of the film strip, hence, is not only paralleled by the breaking of Eddie’s self on the diegetic level but the breaking of the ‘consciousness’ of the film viewing experience in which the ‘unconscious’ cycles of thought buried in the process of sympathy is unearthed. The effect created, thus, is disconcerting, as the viewer’s sympathy is shifted from that of Eddie’s revelation in the light of the conscious revealing of previously buried knowledge (his ‘sin’ of having slept with his father) to the individual’s personal unconscious, forcing the viewer to interact with the issue of ‘revealed truth’ beyond the emotive level. The viewer is prompted, thus, to seek out the various kinds of hidden, buried knowledge that may lie beyond the fabric of his reality in order to ‘mend’ this fracturing of distance between Eddie and himself. The emergence of the previously invisible ‘unconscious’ of the cinematic apparatus, thus, creates the potential for the re-identification of the self, transgressing the politics of identification inherent in the conventional film viewing experience. The instability of the actual cinematic apparatus in producing congruity is revealed to be concurrent with the instability of the fluidity that all ideologies of the self project. The break in identification, thus, serves to create a more involved film viewing experience, in which the watcher is forced to evaluate the ideas the director presented through Eddie’s tragic sexuality. As Eddie’s sexuality is innately flimsy and unclassifiable into discrete categories, the viewer forced to question all ideas inherent in the structuring of individual sexuality. The revealing of the filmic text, thus, ultimately allows for the viewer to relate to the material beyond the diegetic level to the personal level. origin of meaning” (Baudry 286)8, inevitably affecting the way the viewer relates and identifies with the subject. This funnelling of vision on the subject enforces a specified ideology of value that is complicit with the ideology the film originates from, namely the director’s vision and the system of production he works under. The use of lens of different focal lengths changes the perspective of an image, manipulating the way objects are seen. By controlling the areas of reality in which the viewer sees, the viewer is inevitably caught up in the ideology associated with that particular position. The camera, thus, forms a bridge between the raw material of reality and the finished film product- it projects a reality of the second order that is imbued by the values of the director. However, the ‘monocular vision’9 of the camera is problematic as it erases the multiplicity of viewpoints and perspectives that is inherent in experiential reality. This simplifies the process of identification that occurs in the watching of film, allowing the viewer to relate on a visceral level to the universe the film encompasses by closing distances between viewer and subject, ensuring the sympathies of the viewer are pre-determined by the ideology of the director. In addition, cinema relies on the setting apart of filmic from experiential reality. The viewer accepts the reality as an objective reality and thus, spills “libidinal forces, at the expense of the whole (of reality)” (Lyotard 350). The film product, thus, is “the paradoxical product of the disorder of the drives... a composite of decompositions” (Lyotard 351). In order for identification to take place, the viewer has to invest time, energy, and emotion into active engagement with the central protagonist and story. Funeral Parade of Roses challenges the power intrinsic to the camera’s singular eye in the manipulation of camera angles and lens. This, in turn, complicates conventional ideas about perspective, point of view and the nature of sympathy. In the shot after Eddie has pierced his eyes, the camera shifts to the point of view of Eddie and the viewer is led down a dark tunnel in which a few, lone solitary figures are illuminated, presumably the bewildered stares of spectators played by actors. The spectators shy away from the blinding, overexposed light the eye of the camera shines in expressions of horror but are unable to escape this oppressive light. This accentuated perspective of the world created by a wide angle lens in a point of view shot continues as the viewer is led through a dark passage from Eddie’s secluded room into the overexposed realm of the world exterior to the apartment. The door connecting both realms, here, is shown as a single, overexposed patch of light. When Eddie exits the building, the camera abruptly cuts away to a long shot in which the viewer sees Eddie tumbling out of the building, knife in hand. The camera proceeds to revolve around Eddie’s face in a critical fashion as though examining him, and the viewer sees the bewildered faces of a crowd of spectators in the background. A final dizzying movement proceeds as the camera swerves away from a close-up of Eddie’s face, before zooming in on Eddie’s knife and ending at an abrupt tilt. 9 I refer to Pleynet’s term “monocular vision” used by Baudry in reference to the perspective of the camera, in which Baudry attributes the single eye of the lens to the singular point of view it carries. initially drawn into the pathos of Eddie’s tragedy by the use of a wide angle lens that creates a single point of view from the perspective of Eddie. A confusion of identity results, as the viewer ‘becomes’ Eddie, tumbling through dark, groping corridors (symbolic of the darkness of the psyche, the ‘hidden consciousness’) with pierced eyes. However, the sharp cutaway from a screen dominantly black with a single spotlighted center to an overexposed shot wherein Eddie is shown at a distance creates a fracturing of sympathy. Distance is created between the spectator and protagonist in which the camera shifts from taking on the position of a dominating device asserting control and creating subjective reality to a position in which the camera acts as a documentarian device showing different positional relations. The camera turns from a surveillance device, thus, to a critical eye. As a result, the innate absurdity of Eddie’s situation emerges. The viewer’s focus changes from that of intimate sympathy to that in which he analyses the filmic image from a distance, allowing for a space in which the viewer interacts with Eddie’s tragedy beyond the emotive level. In addition, this shot disrupts the illusion of fictional reality by introducing actual passers-by into the film, thus mixing documentary filmmaking with the construction of artificial realities. After Eddie commits his final, melodramatic act of piercing his eyes in a final denial of vision, he travels through a dark tunnel into the overexposed realm of reality. Metaphorically, the viewer is led with the careful guidance of the camera from the fictional, encapsulated world of Eddie’s apartment into the immediate reality of raw experience through a dark tunnel that serves as a bridge between fictive and experiential reality. The melodrama of Eddie’s tragedy manifested in the inherent theatricality of the image is presented in all its force to the viewer: Eddie carries a knife, dressed in a suit that looks increasingly like a clown’s outfit. His overdrawn make-up- the outward manifestation of his status in society as ‘homosexual’- looks increasingly like a disguise. Here, the viewer is reminded of the absurdity of filmic reality by the startled stares of passers-by, who the director states in the commentary were actual people. The critical eye of the camera revolving around Eddie’s face contributes to this critical view. In a subversion of roles, the camera abruptly takes on the viewer’s perspective. The viewer’s reaction, as a result, turns from that of pathos to that of intrigue and speculation with this shift in points of view, and the viewer is forced to re-orientate himself in relation to the absurdity of Eddie’s image. The juxtaposition of experiential reality with fictional reality, thus, serves as the ultimate epitome of the process of revealing that Matsumoto accomplishes in his film. The critical eye of the camera corresponds to the critical point of view the viewer is expected to take towards the filmic matter, calling for a more active viewing experience. In shifting the perspective from that of Eddie to that of the viewer, the viewer is pulled into the film, engaging with the reality the film projects beyond the diegetic level. Finally, the film ends with a single, overexposed shot of Eddie’s knife. The camera tilts abruptly, so the knife appears to ‘pierce’ the desert of whiteness that envelops the screen. The focus is turned from the spectacle of Eddie’s tragedy to the instrument with which he had inflicted his wounds. The knife, here, is symbolic of the ultimate piercing of fictive reality. As Eddie blinds himself after the unveiling of the ‘mask’ covering the truth of his true identity as his father’s lover, the viewer is forced to decide what his reaction is in relation to the revealing of film as fiction and, henceforth, construct his own individual actions in light of the ‘truth’ of what reality connotes in his historical and political milieu. The film, thus, ends on an interrogative note, calling for the viewer to challenge all classifications of thought whether they are about the ideologies of institutional politics, identity or sympathy. Funeral Parade of Roses, all in all, provides a challenging viewing experience to the viewer in its transformation of the viewer’s relationship to the subject. By breaking free from formalist filmmaking by disrupting continuity, organic unity and, finally, piercing the illusion of film as an objective reality, Toshio Matsumoto inverts the process of identification inwardly towards the viewer’s individual persona. The focus of the film, ultimately, ceases to be about the theatre in which Eddie’s tragedy plays out, but the larger stage of life. Metaphorically, Matsumoto creates a ‘bridge’ between fiction and experience wherein all appearances present in the structuring of thought are normatively unstable, thus rendering the viewer’s position in reality equally ambiguous. Funeral Parade of Roses (Bara no sôretsu, Matsumoto Toshio, 1969, 105 mins). DVD. Guerry, L. Brion, Jean Pellerin Viator (Paris: Belles Lettres, 1962). Print. Lyotard, Jean-François, “Acinema,” Narrative, Apparatus, Ideology: A Film Theory Reader, ed. Philip Rosen. (New York: Columbia UP, 1986), 349-359. Print. We've had a lot of satisfied customers in 2012; we plan to close out the new year by offering some really cool stuff Moving Ink Blot Masks.